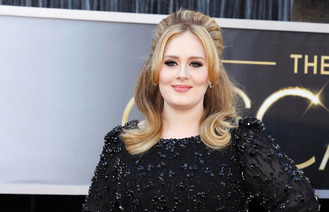 Adele has taken to Twitter to deny rumours she has split from her partner. The 26-year-old singer - who rarely uses social media and has always closely guarded her private life - chose to speak out after The Sun on Sunday claimed she had split from charity boss Simon Konecki, the father of her two-year-old son, Angelo. Adele told her 21.5 million followers: "Just wanted to wish everyone happy holidays & all the best for 2015! PS Simon & I are still very much together, don't believe what you read x." The newspaper had reported the couple were no longer living together and had hardly seen each another in the last two months. It claimed Adele was spending most of her time with her mother and friends in London, while Simon, 40, was living back in his "bachelor pad" 60 miles away in Brighton. The couple did not attend Sir Elton John's wedding last week, and Adele sent a note which is reported to have said: " Biggest congratulations my loves. Have a wonderful day. I'm sorry we are not there. See you in 2015. Love Adele, Simon and Angelo. x." The following list represents the most viral tracks on Spotify, based on the number of people who shared it divided by the number who listened to it, from Monday, Dec.
English DJ Mark Ronson returned to the coveted number one spot in the British singles chart on Sunday with his track "Uptown Funk", featuring U.S.
Alicia Keys gave birth to son Genesis Ali Dean early on Saturday morning. Sam Smith has confessed he would never have auditioned for The X Factor, branding the show "damaging" for songwriters. Jessie J has revealed Miley Cyrus helped pay her rent for years after making Party In The USA a hit. Some people say that we've lost the true meaning of Christmas as the holiday has become all about the gift giving. Avril Lavigne has rubbished rumours that she is in rehab. Former Beatle Sir Paul McCartney has led tributes to rock and blues singer Joe Cocker, who has died at the age of 70. NEW YORK — In a surprise preview of her new album, Madonna released six songs Saturday on iTunes and various streaming services.